Charles W. "Jr." Diacont, 71 of Palmer Township, passed away Friday, December 14, 2007 at his home. 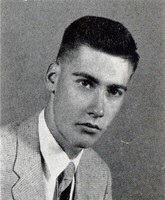 Jr. graduated from Easton High School in 1956 and served in the military. He had been a truck driver for over 30 years, retiring in 1985 from his own trucking business which he operated for two years. Prior to that, he retired from North Penn Trucking Company. Jr. was a former volunteer fire-fighter and part-time police officer for Palmer Township. He loved being in parades with the Palmer Township Retired Volunteer Firefighters and the antique fire engine. He enjoyed spending time with his family, especially his five grandsons and listening to books on tape. May be made to St. Jude’s Children’s Research Hospital, 501 St. Jude Place, Memphis, TN 38105-1905; or to the church, 177 N. Greenwood Avenue, Easton, PA 18045.Private services will be held at the convenience of the family under the direction of the Strunk Funeral Home Inc., Wilson Borough. Burial will be in the Northampton Memorial Shrine.In addition to his wife Wilma, he is survived by two daughters, Patricia A. Sweeney of West Bend, Wis., and Kelly F. Picht and her husband Major Robert G., Jr. of Wamego, Kansas, and five grandsons, Sean and Liam Sweeney, Daniel, Ryan and Dylan Picht.He attended First Baptist Church of Easton. Jr. was a member and president of the Palmer Township Volunteer Firefighters Association. He was also a member of the Loyal Order of Moose, Lodge 45, and Brown & Lynch American Legion Post 9, both of Palmer Township.He and his wife, the former Wilma F. Kessler, celebrated their 44th wedding anniversary on March 23rd.On July 9, 1936 in Easton, he was a son of the late Charles S. and Evelyn Sassaman Diacont.